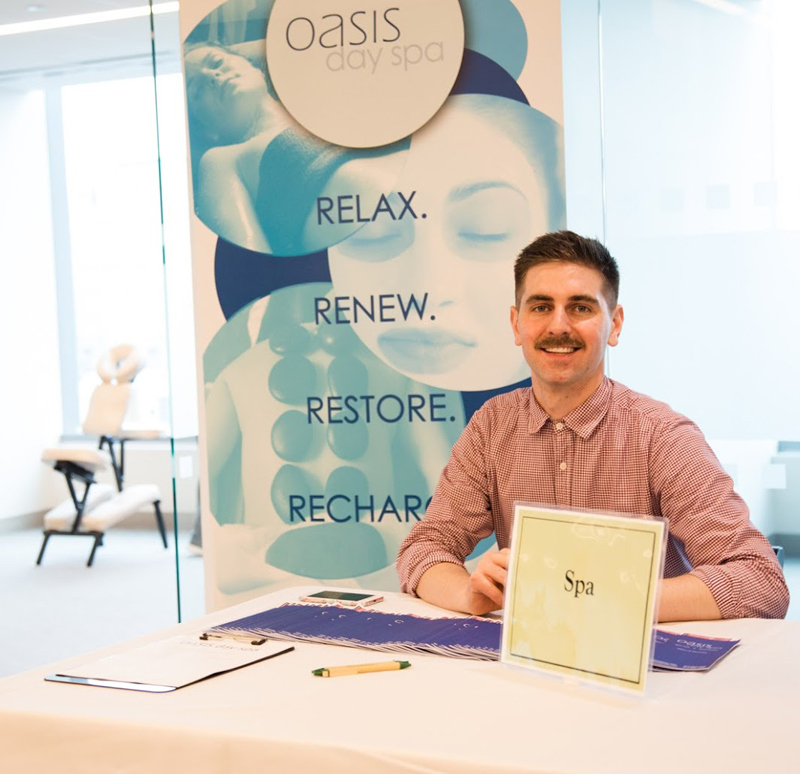 This event is directed to help with a combination of delivering a pampering relaxing experience to the employees during the events (including stress reduction) and addressing the beauty aspects and wellness and fitness aspects as well. This event is directed to help employees with getting relaxing and stress reduction and a stress relief in the middle of the day. We believe everyone is allowed to have fun and should take care of themselves. The purpose of workplace ergonomics is to increase the comfort, safety and efficiency of workers by fitting the workspace environment to them not the other way around. Length of massages may vary but usually it's (10-15min per employee). It is best to pre-register for the massages and we can send you a list for you to get employees pre-registered in 10min time intervals. "I have been delighted with EMG's Health Fairs for over three years! It is a great pleasure to work with such a professional, hard-working, organized and creative team. 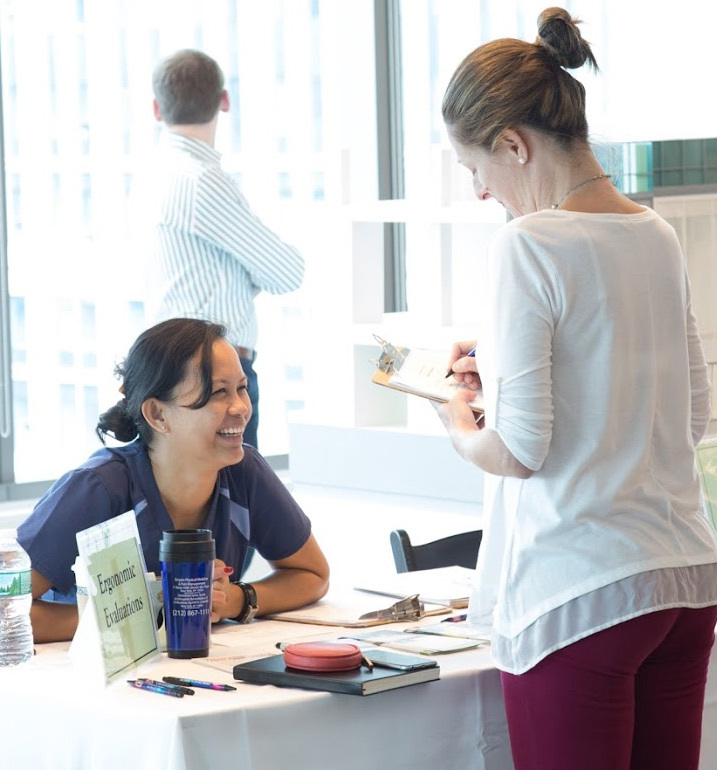 This year we added the successful program "Massage Day" on the first Friday of the month for employees to unwind, relax and return to work energized after a long week of travel. I receive multiple emails from employees expressing gratitude for our Spring and Fall Health Fairs and the monthly Massage Days. The highest marks to EMG! "In addition, employees loved the ergonomic evaluation day you organized. This helped employees realize how little things can bring a big difference in their posture and working environment. This was the first time MCMC held this type of event and I am happy to say it was a big success. Employees also loved the 5 minute chair massage they received along with the healthy snacks. That was the greatest event of the day. Our staff are already asking about our next health and wellness fair and the ergonomic evaluation. Thank you again. I am looking forward to organizing our next Health event in the summer." S.R. Set up a massage program with us. Massage therapists will come into your office weekly, biweekly, monthly, or you can propose your own schedule, or sign up for a one-time event. Chair massages last between 10 to 20 minutes each. For regular massage day, we have online registration solutions so that all scheduling is done automatically. "This was great and convenient." "This was a great experience, really appreciate this benefit. Thank you." "Need to expand to 2-3 times a week." "Thank you will use this as long as it is available, twice per week would be great." Employees who are appreciated at work will be happy to keep working at that company. Employee turnover is of great cost to employers, so keeping good employees is very important to the health of an organization. Happy employees are motivated employees. If you validate and show appreciation for your employee's good work you will get better employees and more good work. Validating your employees with an employee Wellness & Appreciation day will encourage your employees to recognize and respond to the positive things they observe about their peers. Employees that are appreciated year-round are more liable to be convinced that management has their best interests in mind. This event has 2 parts the first part is a tailor-made workshop/talk on a topic that is of interest for the employees. We can do a survey or send a list of popular topics. After the workshop/talk, interested employees can receive the following. 1) A one-on-one consultation for 5-10 min with the health professional. 2) A chair massage for 10 to 15 minutes. This service is open for the whole company so we will provide a pre-registration list where employees can register prior to the event. 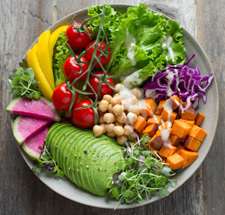 This event is directed to help employees with getting stress reduction and a stress relief in the middle of the workday as well as receive a Nutritional consultation/evaluation. Chair massages are between 10 to 20 minutes each. Nutritional Consultation will be between 10-15 min.